I’ve always heard that English is the hardest language for people to learn because it’s the least logical. Logic of English has made its mission to dispel that myth by finding and explaining the way the language works – and more specifically why it works the way it does. 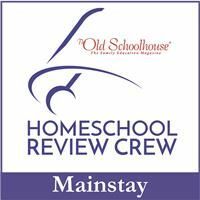 I’ve had the privilege of reviewing their Essentials 2nd Edition curriculum with the boys over the past several weeks, and I’m excited to tell you all about it today. There is so much involved with this curriculum, but it all works so easily (for the teacher) and in perfect harmony that it was a true pleasure to implement this into our school day. When you get your package, there will be a lot of things in there (it was a heavy box! ): textbook, two workbooks, five packs of flashcards, two packs of game cards, and a pack of game tiles. I’ll go over these items one at a time in the coming paragraphs. The main component is the textbook, which acts primarily as the teacher’s manual. It’s a very heavy, hardcover book with over 600 pages. The first hundred or so pages is instructions for the teacher, explaining how to teach the course. Then comes the placement test so you know which level to use with which student (there are 3 levels, and all three levels can be taught using the same book). After that are “pre-lessons,” to be used in case your student needs to learn very specific skills before starting lesson 1. The bulk of the textbook is the lessons themselves. The lessons are very teacher-friendly. 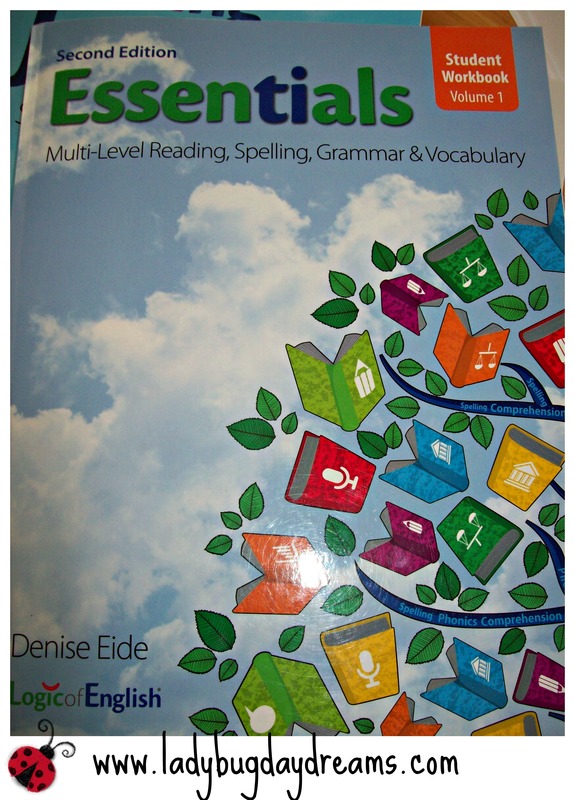 The textbook scripts out exactly what you need to say during the lesson, and there’s even a section at the beginning of each one telling you which of the supplemental materials (workbook, spelling journal, and which specific deck(s) of flashcards) you’ll need for that lesson. 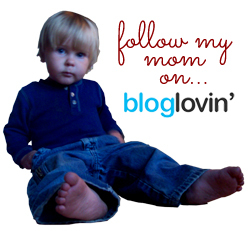 There are 15 lessons, each split up into 5 sections, which is perfect for a school week (even us, since we recently switched back to a 5-day week to make up for all the extra time off we took for the baby’s birth last November). The lessons are very streamlined and rarely took us more than about half an hour. What I loved most about this curriculum is that it’s mostly “open and go.” It takes a bit of time to go over it all when you first get the book to learn the ropes (remember that the first hundred pages are all teacher training). But once you understand what you’re doing, all you have to do is gather the appropriate student supplies and read the script. Easy. The next component is the student workbook. 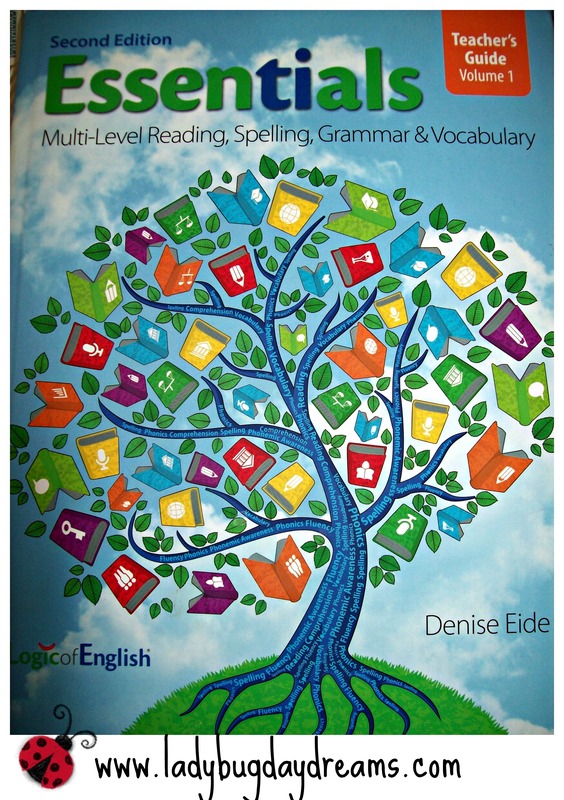 This is a softcover book with over 300 pages that is designed to be consumed by one student. How your student performs on the placement test will determine which level you start them at, but all three levels are included in both the textbook and the student workbook. There are a variety of different types of activities, and because all three levels are included in each book, you could presumably use the same text and workbook for three years. The lessons would be similar from year to year doing it this way, but there would still be some building on the previous year’s learning. 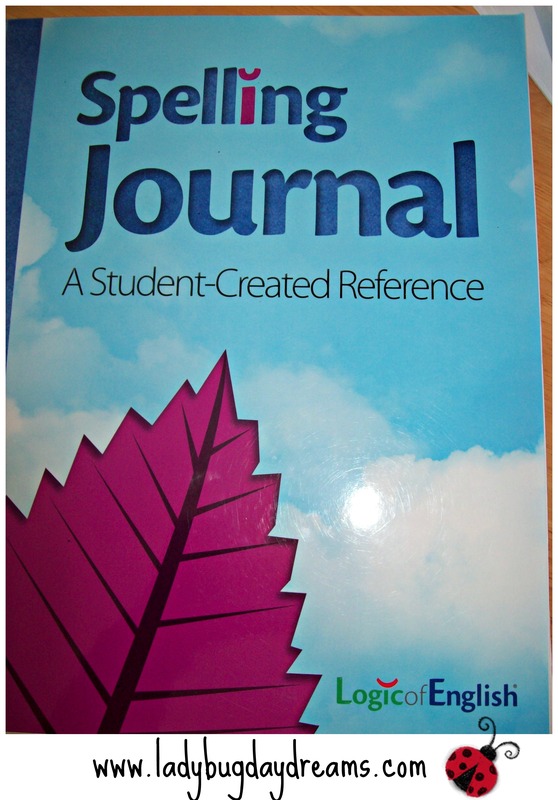 The Spelling Journal is like a dictionary that students create themselves using Logic of English phonograms. The book is divided up using the different letter combinations, with letters creating the same sound on the same page (c, k, and ck, for example). It shows each way of making the sound at the top of the page, and underneath is the rule for when to use that form of the sound and several blank lines. Students are instructed to use the guidelines they learned during the previous lesson and put several words in the correct column. The series of flashcards are really helpful. 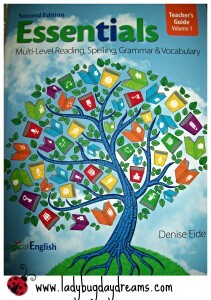 The five decks include: Basic Phonograms, Grammar, Spelling Rules, Advanced Phonograms, and Morphemes. We primarily used the Basic Phonograms and Spelling Rules decks, with the others making only occasional appearances. The textbook will tell you which flashcards you need and when to use them. The cards are clearly labeled so it’s incredibly easy to find the one (or more) you need for a particular lesson, especially if you put them back in order (ABC or numerical) when you’re done, which I did. The flashcards are many, so you’ll need an organized way to keep track of them all. 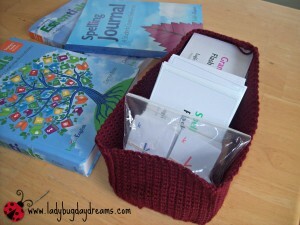 I rubber-banded each deck together, and then stored them in a 10×5 crocheted basket that I made especially for the purpose of storing these cards. In addition to the flashcards, there are two decks of Phonogram game cards, one set in “manuscript” and one set in “book face” (just two different fonts). These cards are used frequently for a variety of activities and games. Their use was probably the highlight of the program for both of my sons. Finally, there’s a set of Phonogram game tiles. We haven’t come across a lesson that uses these yet, so I can’t really tell you much about them except that they exist and are much thicker than the regular flashcards (think of the spinner board from a children’s game). I have these stored in a ziploc baggie in our flashcard basket. The package arrived late in the week, so I took the weekend to go over the teacher training portion and we started in right away Monday morning the following week. We followed the lessons pretty much exactly; because it’s all laid out so beautifully for you, there’s really no reason not to. Since we had just one workbook and Spelling journal, I assigned those to Seahawk since he’s not quite as strong in the language arts as Munchkin. It was enough for Munchkin to do the work orally. I don’t think the kids necessarily loved the program – it is pretty intense – but it’s so easy to work through that they were willing to do so. Logic of English does something that no other company we’ve come across before has done – explained the whys of English in a way that makes sense. For Logic of English, it’s not enough to teach students what the rules are. That’s not to say that knowing the rules is a bad thing, but understanding and implementation jump to a whole new level when students know precisely when and why to use a specific group of letters to make the sound they need. It’s not enough to know that “sometimes C says /k/ ans sometimes C says /s/.” Logic of English tells us when C makes each of its sounds. This has been a vital difference for the boys, especially Seahawk. It’s even been interesting for me to learn, though I’m naturally a good speller (as is Munchkin). It’s good to know why we use which letter(s) when spelling; this knowledge helps the non-natural spellers among us to determine on their own how to spell a word correctly. Long story short: we (I, at least) loved using this program. I saw a marked improvement in my kids’ understanding of their first language. The ease in which I could teach it was a definite plus for our family. It’s definitely something we’ll continue to use. 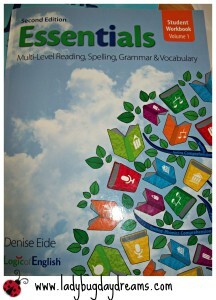 Besides Essentials, Logic of English offers a series of English Foundations for younger students. Members of the Schoolhouse Review Crew are talking about the different levels this week. Click over to the Crew blog to find out more!